Billed the “Capital Connection,” the flight to start in July. Virginia Gov. Terry McAuliffe (fourth from left) poses for a photo at an event to formally announce Air India’s nonstop service from Washington to Delhi. Others identified are: Karima Woods, Director of Business Development and Strategy, DC government (left); Todd Haymore, Virginia Secretary of Commerce and Trade (second from left); Pankaj Srivastava, Director of Commercial at Air India Limited (third from left); Arunish Chawla, Economic Minister at the Embassy of India, Washington (fourth from right); Jack Potter, President and CEO, Metropolitan Washington Airport Authority (third from right); and Mike Stewart, Vice President of Airline Business Development (right). DULLES, Virginia: In a welcome development enhancing connectivity, Air India announced on Friday that it will operate direct flights thrice a week from Washington to Delhi, beginning in July, if not earlier. The national capital region is all set to become Air India’s fifth US destination, following New York, Newark, Chicago and San Francisco. India’s state-owned national carrier will be the only airline offering nonstop service, on its Boeing 777 aircraft, linking the capitals of the world’s largest and oldest democracy. And quite expeditiously, given the distance, duration of the flight is about 14 hours. Addressing an event to announce the new route on Friday, Virginia Gov. Terry McAuliffe noted that Air India’s “capital connection” will benefit the Washington metropolitan region (District of Columbia, Maryland and Virginia) by bringing an estimated 30,000 people from India, generating about 30 million dollars in revenue, fostering educational opportunities, and reuniting families. In 2015, the capital area received 122,000 visitors from India, a 25 percent increase from the previous year, making India the fourth largest overseas market. By 2020, arrivals from India are estimated to increase by 7 percent and by 2025, they are projected to double. “We committed 1.25 million dollars to this project for Air India because we understand that tourism is such an important revenue generator,” McAuliffe said. “Tourists who will now come here from India will help strengthen our communities, make us stronger”. The event was held at the Washington Dulles International Airport, which is situated in Fairfax and Loudoun counties, Virginia, approximately 26 miles west of downtown Washington, and serves the entire national capital area and beyond. A few days before, McAuliffe had come to the airport to support those protesting President Trump’s executive order which bans travel for people from seven predominantly Muslim countries: Iran, Iraq, Syria, Sudan, Somalia, Libya and Yemen. The Democratic governor underscored, “We are open and welcoming to everyone. We do not discriminate here in the Commonwealth of Virginia,” he said, to applause. Pankaj Srivastava, Director of Commercial at Air India Limited, focused on the expansion of the airline on the global circuit mentioning that in the last three years it has added eleven international destinations, and Washington will be the twelfth. “The turnaround has been tremendous,” he said, predicting that with the addition of the new route, it will be even faster. “We would be part of the success story of Virginia,” he affirmed. Jack Potter, President and CEO of the Metropolitan Washington Airports Authority (MWAA), enthused, “We are very excited about this announcement. We serve thirty capitals around the world and we are looking forward this summer to adding another one,” he said. Cognizant of the reciprocity, Potter mentioned that people in India are “super excited” about the opportunity to travel to the Washington metropolitan area. 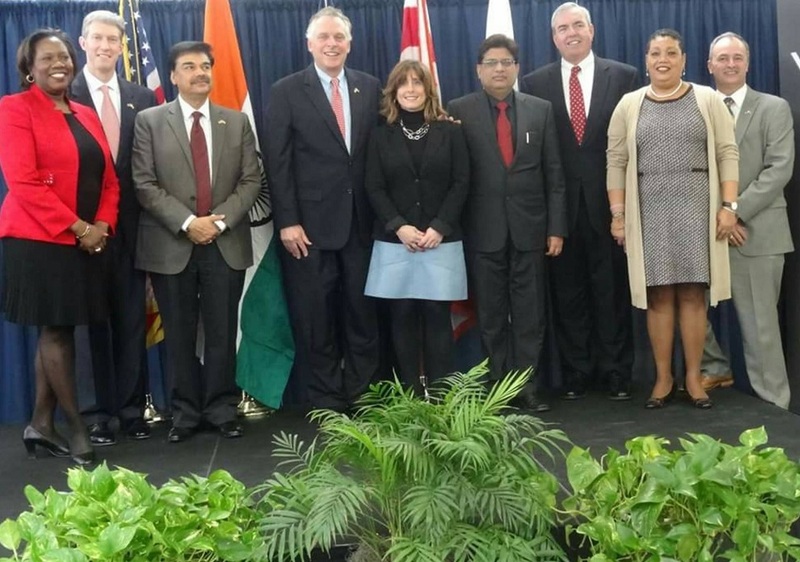 It is noteworthy that when Governor McAuliffe led a large trade and marketing mission to India in November 2015, he was accompanied by Todd Haymore, Virginia Secretary of Commerce and Trade, and they both underscored the importance of Delhi to the Washington capital area. It was there that they met with executives of Air India who agreed on a new route to Dulles Airport. McAuliffe was appalled that US citizens with two young children were detained at Dulles airport soon after the order was signed. “We are not going to tolerate it,” he said. The Governor noted that in Virginia alone, there have already been two instances when people were coming on economic missions and canceled their plans even though they are not from one of the seven countries affected by the ban. “I think this will affect all of us economically and I do worry about the implications,” he said. “The message that is being sent today is, I think, a very bad message for America,” he said. It goes against “our value system of being open and welcoming. I think it is very bad for national security. I think it has put a target on our men and women in uniform who are serving abroad” and terror groups can use it for a recruiting tool, he said. Noting that “India is a country with over a billion people which will have the largest Muslim population in the world by 2050,” the Governor said, “We don’t want to send any message to anybody” which is contrary to the values of being open and welcoming. Referring to the early immigrants who came on ships to Jamestown, Virginia, in 1607, he said, “They were not turned back from the water’s edge. They were welcomed in what is now the United States of America. We are going to foster that as we go forward,” he pledged.